Filmmaker Wim Wenders presents a Berlin that epitomizes an era. Sometimes a movie sums up its era in a fashion that later seems inevitable, or maybe filmmaker Wim Wenders somehow just knew his hometown of Berlin was on the verge of transformation, the fall of the Wall less than two years away. Somberly adrift in a city that more than any other manifested the 20th century, wandering a limbo between life and death—where the human spirit is caught in a loop of devastation and endurance—hipster angels in black are stunned by their own helplessness, by how little serenity their touch brings to suicides leaping from heights only angels should know. The great German actor Bruno Ganz is the slightly wayward seraph yearning for humanity, for the taste of coffee and his own blood when he hurts himself, but mostly for the acknowledgment if not the arms of the beautiful trapeze artist who dazzles a black-and-white life (shot by Parisian cinematographer Henri Alekan) into color. 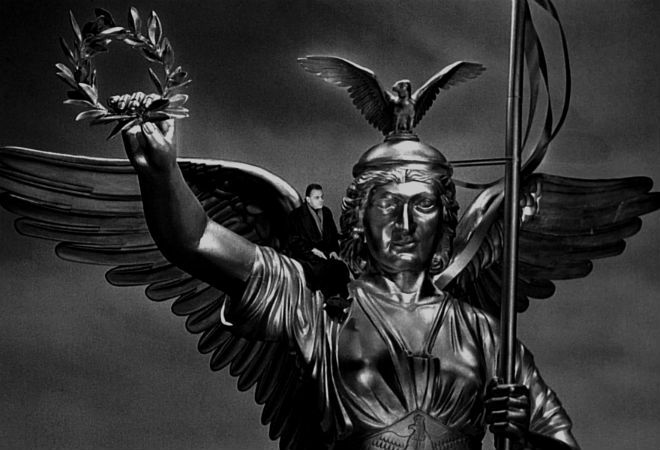 Wings of Desire is part meditation and elegy, part fairy tale and tone poem—a medley of conflicting emotional timbres including fatalist hush, adult whimsy, and the eternally tragic, all seeming of a piece with the center of gravity nothing less celestial than Ganz’s soulful face.